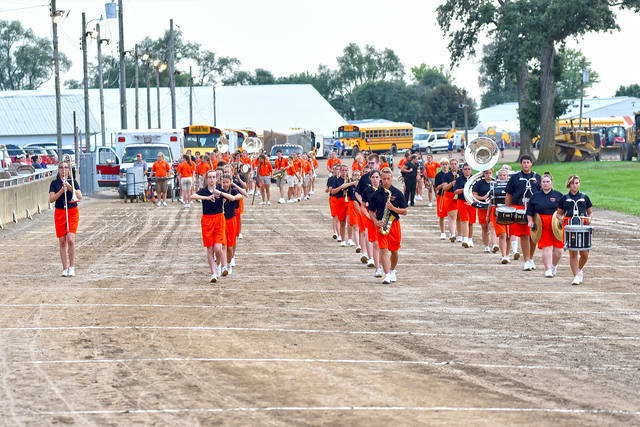 The Versailles marching band was composed of 71 members. Ansonia’s show featured music traveling through the ’90s with “Enter Sandman” by Metallica and “Smells Like Teen Spirit” by Nirvana. The Tri-Village band showcased improved numbers this year with a total of 52 members, doubling the size of the last few years. 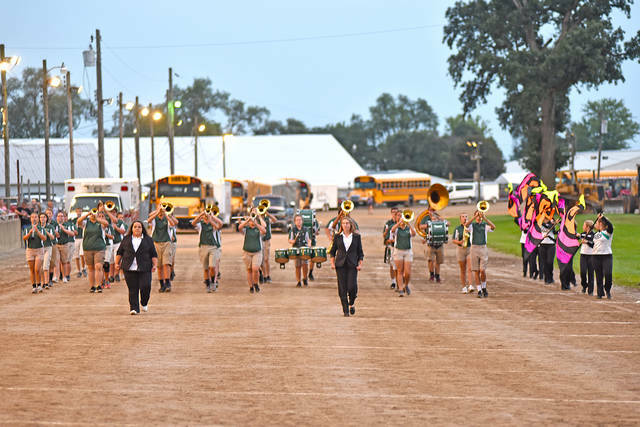 GREENVILLE – The Great Darke County Fair presented the 35th annual Band Spectacular Monday evening at the Fairground Grandstands. The event was kicked off with the Mississinawa Valley band performing the national anthem. 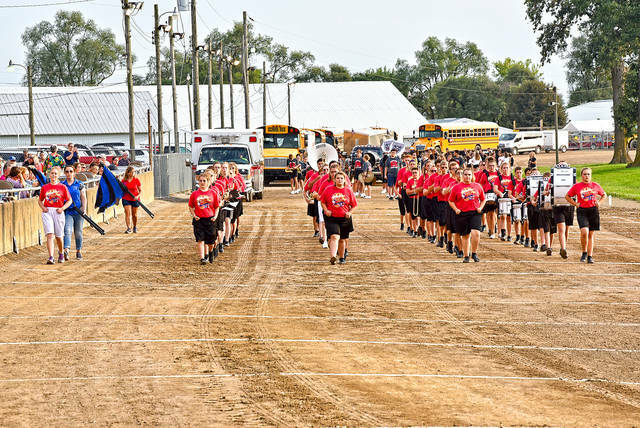 Mississinawa was one of six Darke County schools participating in the event, which also included Arcanum, Ansonia, Greenville, Tri-Village and Versailles. The Tri-Village band is led Derek Bialowas, who is in his third year as the director. The band showcased improved numbers this year with a total of 52 members, doubling the size of the last few years. The Patriot band is looking forward to performing on Friday nights at football games this year. Arcanum’s theme this year all about “Words.” The soloist in the show are: Dylan Rhodehamel, trumpet; Karr Stump, vocalist; Tanner Delk, saxophone; Braydin Gillem, tuba; and Audrey Ball, clarinet. Ansonia had 28 members in its band and is under the direction of Jessica Berry. It fair show featured music traveling through the ’90s with “Enter Sandman” by Metallica and “Smells Like Teen Spirit” by Nirvana. 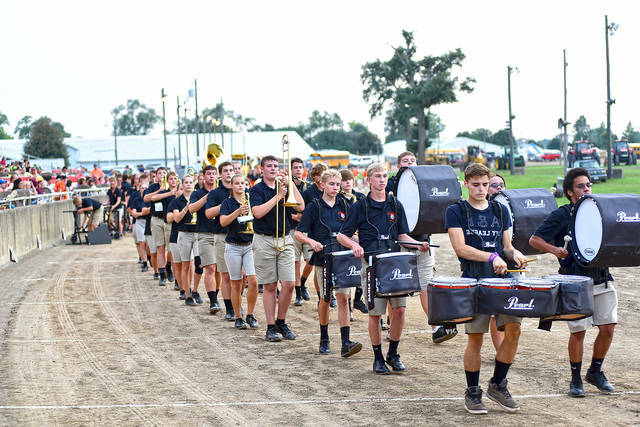 The Versailles marching band was composed of 71 members including three field commanders, eight guard, 10 front ensemble, five battery percussion and 46 winds. 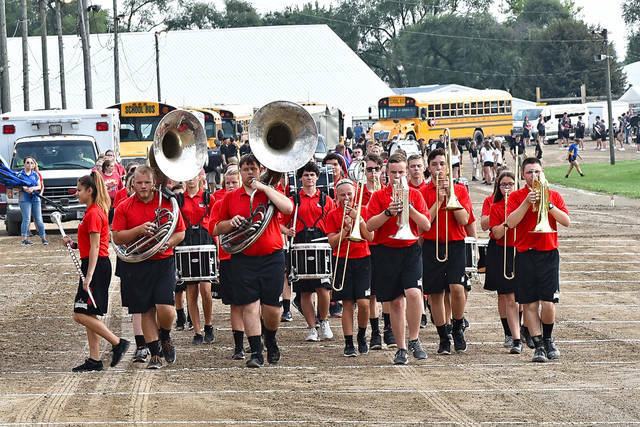 Other non-county bands performing were Tri-County North, Marion Local and St. Henry. The highlight of the evening was what all nine bands came together to perform. The Massed Band was led and conducted by Ronda Stammen, the current Versailles band director for grades 5-12. The group performed “Sweet Caroline” by Neil Diamond and concluded with “God Bless The USA” by Lee Greenwood. In all it was a fun evening for all who attended and a chance to support these fine bands. 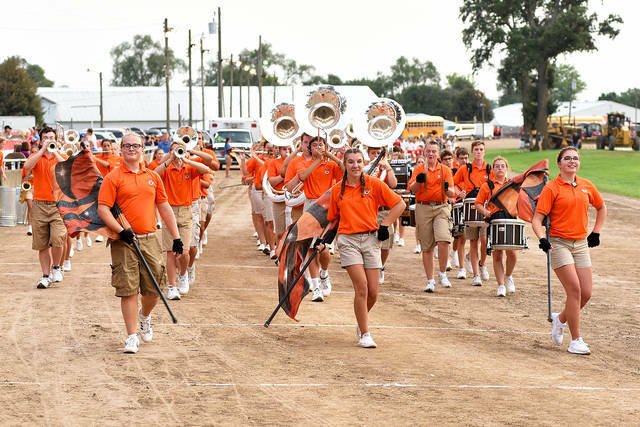 This entry was tagged Ansonia, Arcanum, Band, Band Spectacular, Bands, Darke County Fair, Fair, Greenville, Marching band, Maria Stein, Marion Local, Mississinawa Valley, MV, New Madison, St. Henry, Tri-County North, Tri-Village, Union City, Versailles. Bookmark the permalink.